You are currently browsing the Collector Model blog archives for April, 2014. The popularity of mainstay pop-culture characters can be tracked back to the earliest instances of licensed merchandise. Superman debuted in the comics in 1938 and less than a year later, the first merchandise was offered to the burgeoning crowd of fans. The Supermen of America Club supplied members with a button and official membership card. Supermen of America rings were offered to new members in 1940 and over time have become one of the most sought-after collectibles ever. In the early years, trading cards were introduced. 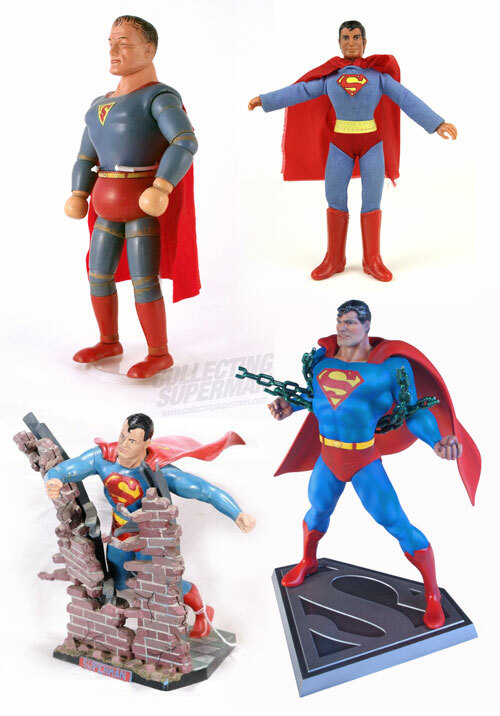 They were followed by nearly anything that could have a Superman logo applied to it from lunchboxes to puzzles, books and records, action figures and of course… today’s Superman model kit. Characters like Superman change with the times, but still resonate with every generation. As sensibilities evolve so do the characters and the various interpretations of them. Technology allows our look at the characters to become more defined. In the comics, the original interpretations offered on pulpy page stock by his creators Joe Seigel and Jerry Shuster gave way to the visions of Mort Wiesinger and Curt Swan (among many others) to the more contemporary renderings by Neal Adams and John Byrne to the version offered on today’s glossy page stock or the subtle glow of a tablet. The big and small screen offered a range of interpretations from the shorts created by the famous Fleischer Studios which put still images into stunning motion in a series of cartoons to the live-action serials starring Kirk Alyn to the TV series starring George Reeves to the most fondly remembered depiction supplied by Christopher Reeve in four films to last summer’s blockbuster film. Every time we see a character depicted in a new way, we are biased (whole-heartedly or in part) by the previous interpretations of him. Some people are die-hard fans of the old stuff, the stuff they grew up with as kids and have loved ever since. Some people are coming to the party late and they latch on to the version being offered at that time. Some are into it for a while and eventually let it go. Others are life-long fans. For sci-fi and pop culture modelers, I’m not telling you anything you don’t already know. You know if you like Star Trek better than Star Wars. You know if you like STAR TREK: The Original Series better than STAR TREK: The Next Generation. You know if you like the Curt Swan interpretation of Superman better than Jim Lee’s. Classic TV show Batmobile or the Tim Burton version? Our recent Superman and Wolverine super-hero kits were created with the mindset of appealing to the widest audience possible. The Wolverine kit offers optional heads to appeal to guys that want something a step closer to the recent movie versions. We chose the costume to depict his iconic early appearance, but it was engineered to allow easy modification to create other later versions. Superman depicts one of his most iconic comic book covers, but with a little adapting he can look more like any of his various incarnations. So, my question to you, the modeling public, is what do you like? (Please don’t misinterpret the question as “what do you want?”) Did you like the Man of Steel movie? Did you like The Wolverine? Do you like what Marvel Comics is doing right now or do you like DC better? Are you into the Arrow TV show or are you more excited about STAR TREK: TNG being remastered to be released on bluray? While you are at it, let us know what you think of our recent figural model kit releases. Feel free to let us know by responding here on the blog or on our Facebook repost.